Is it only me that find it strange that the Music, Pictures and Video folders doesn’t contain the example content from the Free Culture Showcase? The discoverability is really low IMHO - which is a shame. I have not filed a bug yet, I just wanted to know if anyone else share my experience? Good point. That looks like a bug but I am not sure what component should be responsible for creating links to those from home directories. Alternatively, I would also understand if it was decided that populating peoples’ home directories like that was inappropriate. Well there is the link presented in the Home directory, why duplicate. 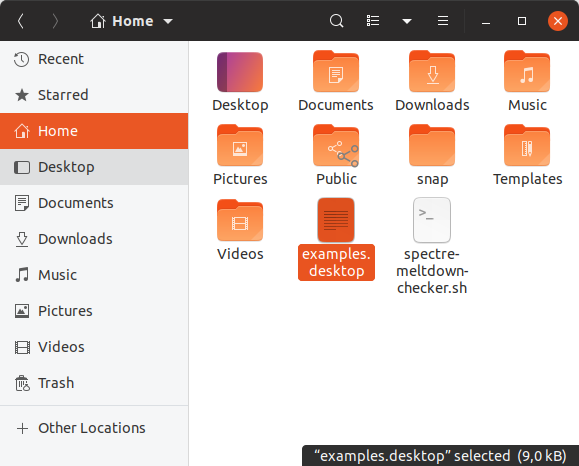 When nautilus 3.30+ lands that link or any type of .desktop won’t work anyway… (in nautulus, unless Ubuntu plans to revert that change. Maybe just add a default shortcut in Nautilus, named Examples. No specific file/directory name is needed in home directories really. That makes perfect sense. For people that have their private photos and music collection I can see the problem. Also, what would happen when upgrading. What about “pinning” the example folder in the sidebar like I have with the Yaru folder in the screenshot above? Yes I was suggesting just pinning the examples folder in the Nautilus sidebar. Although I also wonder if there’s much value in keeping the Free Culture Showcase at all. It’s 13MB of uncompressible data that most users will never want or look at… @popey? 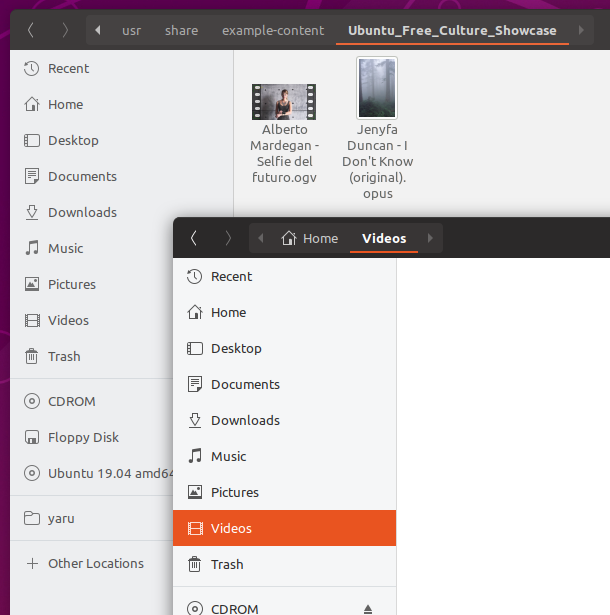 The Ubuntu Free Culture Showcase is an opportunity to show off high quality free culture content in Ubuntu. Perhaps there’s too few entries for the quality to be really good every release. Maybe the audio and video contest should be tied to the LTS releases? I would get rid of this entirely. I’ll just tag @nhaines perhaps he has some comments regarding this feedback. I was asked when some team or another (marketing, maybe) wanted to remove the Examples shortcut from the desktop in the live image, if I was okay with that. I was, it made sense. I thought maybe it’d be fun, then, to put the example content into the Music, Video, and Pictures folders just for the live session. That would have been a lot of work and we were sort of down to the wire on 18.04 LTS, so it didn’t happen, and I didn’t follow up. The music, video, and wallpapers are all part of the Free Culture Showcase, and only the wallpapers are done every cycle. The video and music are done only for LTSes, and there are not a lot of contributions. I had to really rush to create the 16.04 LTS video at literally the last moment to be included in the release. But the wallpapers are updated every cycle, and in fact the Desktop Team was interested in doing a little more with that, so I need to reschedule a call with them, since it sort of disappeared among all the holidays this winter and it’s just about time to start again. Thank you for the reminder!